Thum! Kaun Aata Hai? : Indian Navy Sticks with DRDO Developed AIP, for Better or Worse! Indian Navy Sticks with DRDO Developed AIP, for Better or Worse! The Business Standard reported on July 20, 2015 that because of delay in DRDO's Air Independent Propulsion (AIP) project, which is almost 4 yr behind schedule, only the sixth Project-75 Scorpene would be fitted with an AIP plug. It is also possible that all six Scorpenes would be built without AIP. The Indian Navy had earlier asked Mazagon Docks Limited (MDL) to equip the fifth and sixth boats with AIP by fitting an additional 300-t section on the last two Scorpene submarines built at MDL under Project 75. MDL and French firm DCNS, which developed the Scorpene, are responsible for fitting the new hull section and safely integrating the DRDO-developed AIP plug to the submarine. DCNS initially offered its first generation MESMA AIP with the Scorpene, but the Indian Navy opted to go with a second generation DRDO developed 300-t AIP based on fuel cell technology. DCNS has since developed and demonstrated to Indian journalists a fully tested second generation operational-scale fuel cell AIP that would allow the Scorpene to stay submerged for 3 weeks, but the Indian Navy hasn't been swayed from its decision to go with the DRDO AIP. DRDO has demonstrated its AIP technology on a land based prototype. Trials on a land based submarine section were to commence from March 2015 and full scale operations of a AIP System was to be demonstrated within 2015. The Navy's penchant for sourcing its systems from within India is well appreciated in the country, but there can be no denying the risk that the Navy is taking by adding to its fleet, in this day and age, new submarines without AIP! India's adversaries, China and Pakistan, have been operating AIP subs for years now! The following comparison may help readers assess the risk for themselves. Please feel free to your your views through the comments section. The MESMA AIP from DCNS mimcs nuclear propulsion. It uses heat generated through combustion of ethanol (grain alcohol) and stored oxygen at a pressure of 60 atmospheres to power a conventional steam turbine power plant. It doesn't use fuel cells. DRDO's AIP uses PAFC, which has some advantages over other fuel cell types. PAFCs offer a broader choice of fuel being more tolerant of fuel impurities. It can operate using reformed hydrocarbon fuels (Methanol) or biogas. PAFC fuel cells were one of the earliest to be developed and are commercially available of the shelf (COTS). The only downside of PAFCs is the use of phosphoric acid as electrolyte. However, use of modern materials makes PAFC safe enough for commercial use at hospitals, schools, office buildings, and grocery stores. It's likely that the DRDO plug uses commercially available PAFCs. The second generation fuel-cell AIP developed by DCNS usees hydrogen produced from diesel fuel by hydrocarbon reforming. One obvious advantage of the DCNS AIP is the easy availability of diesel at any port around the globe. The absence of pure-oxygen in the cells allows longer life cycle. 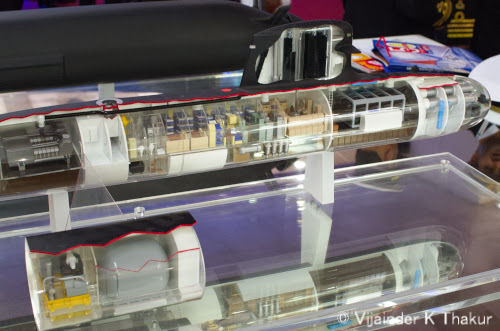 DCNS claims that the life cycle of its new AIP plug roughly matches the life-cycle of the submarine, which isn't the case with other fuel cell types. There is no doubting the sophistication of the DCNS 2nd generation AIP, which has to be weighed against the higher initial cost, high recurring cost from the need to use AIP is all future conventional subs, and the continued dependence on foreign technology. But then DRDO has a well earned notoriety of delays!